GallowayTwpNews.com first reported in January 2013, of a resolution tabled by Galloway Township Council that would have approved a payment of $51,765.24 to former Township Manager Stephen Bonanni. The payment would have represented the monetary amount of unused Vacation, Sick and Compensatory Time. On February 12, 2013, Galloway Township Council voted on that resolution and denied any compensation to be paid to Bonanni. Bonanni previously was under intense scrutiny not only by the former Publisher of GallowayTwpNews.com Harry Scheeler, but also by the Press of Atlantic City. Discovered first in January 2012 by Harry Scheeler, documents indicated Bonanni approved compensatory time to be paid to two salaried employees. Of those salaried employees was CFO Marilyn Dolcy. Dolcy requested payment of compensatory time for missed lunches on just about every day she worked. Dolcy through her attorney Sal Perillo, Esq., voluntarily gave up the time Bonanni previously awarded her. Scheeler also reported Bonanni was teaching for Rutgers University Public Works Program while still be clocked in on Galloway Township's time. Cell phone bills were used to trace Bonanni's location at Rutgers while his time sheets showed him working in Galloway the same day. In another twist of events, Scheeler also linked Bonanni in an alleged prostitution scandal while working for Galloway Township. GallowayTwpNews.com under new Publisher Lisa Tilton, made contact with the first alleged prostitute, prior to this publication in order to confirm the allegations of prostitution. Since the Atlantic County Prosecutors Office has already made contact with the same individual and as to not impede their investigation, our in-depth conversation can not be released. As Tilton is the new publisher and was also the plaintiff in a 96 page lawsuit against the Township and Bonanni, which has subsequently been settled, we decided to investigate the reasoning as to why Council continued to delay the authorization of payment to Bonanni. Tilton as the former Clerk for Galloway, also sat in on closed session discussions while Bonanni received an impromptu interview on January 25, 2011 to become acting Township Manager. The interview was a result of Council removing Roger Tees as their Manager at that time. With Bonanni no longer being an employee of Galloway Township, the closed session minutes were subsequently released to former publisher Harry Scheeler. Detailed in the minutes only two weeks after Council originally appointed Bonanni as Acting Manager, discussions commenced in allowing Bonanni to have a Memorandum of Understanding (MOU). Details in the MOU released below, outline personnel policies and ordinances that Bonanni would have to abide by. Although the MOU was not labeled as contract, Bonanni did receive additional assurances that he would receive payment of all of his Sick Time if in fact legislation was passed that would limit the amount. Also as part of a verbal agreement with Council, Bonanni was authorized to work without clocking in. Bonanni requested not to have his time tracked as he was a salaried employee that works more than 40 hours a week. Leaving himself to be a 24/7 employee, meaning Bonanni could be working at any time of the day. Also detailed in the MOU as part of those discussions was a provision that allowed Council the right to terminate the terms of the MOU if the acting Manager is removed for "Good Cause." Good Cause shall mean conviction of a crime or offense involving moral turpitude. Moral turpitude by standards of New Jersey Law, include but are not limited to conspiracy and prostitution. 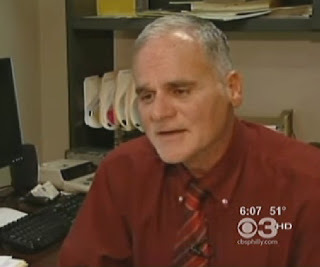 Bonanni was never removed by Council as he decided to retire in January 2012 after former publisher Harry Scheeler began to OPRA Bonanni's Township Cell Phone Bills and Township Computer files. After Council tabled the Payout resolution for Bonanni and after reviewing the closed session minutes and the MOU, GallowayTwpNews.com reached out to Mayor Don Purdy on January 23, 2013 and requested comment. We have released our full email to Purdy below. As of time of publication, Mayor Don Purdy has not responded for comment. After our email to Purdy raising questions about Bonanni's MOU, Council subsequently voted unanimously to deny Bonanni his payment. We issued another request for comment to Councilman Jim Gorman and Councilman Jim McElwee requesting if our email in January prior to Council's decision was a deciding factor for council to deny payment. **Updated** Due to a Township email server issue, a comment from McElwee was sent but never received. In response to our email for comment McElwee stated, "As you are aware I requested the original resolution be tabled for legal review. After review it was presented to Council and again tabled for closed session because some council members wanted further clarification on legal issues. After returning to open session I voted NO to the resolution. Your e-mail to Mayor Purdy played no part in my decision and to my knowledge was never discussed in my presence. The ACPO does not comment on any status or even the existence of any investigation. However, I believe there have been enough questions and doubt raised by your publication and other local news orgs. to warrant such an investigation. If the ACPO doesn't move on this, I would favor an independant investigation be conducted. I strongly believe Council did the right thing. I could not in clear conscience approve this expenditure. There are too many questions as to the accuracy of the hours of service "on the job" which this payout is based on. Again, I would like to state that council acted in the best interests of the people of Galloway Twp." GallowayTwpNews.com in our email to Purdy raised questions surrounding the context in which Council decided to enter into a MOU with Mr. Bonanni in 2011. During such time, Bonanni was alleged to have frequented visitations with at least one prostitute and to our understanding, an investigation was being conducted by the Atlantic County Prosecutors Office during 2012. Through a request by former publisher Harry Scheeler to the ACPO under Executive 69, charges have not been filed against Bonanni as of 2012. Current Publisher Lisa Tilton stood in front of Council in June 2011 and publicly requested Council to form a "Municipal Investigative Committee" to investigate the actions of Bonanni. Council did not form such a committee to investigate Bonanni. Had Council formed such a committee in 2011, Council would have been able to not only subpoena documents, but they also would have had powers to subpoena witnesses for testimony, potentially discovering some of the allegations Scheeler exposed. *Updated* We further requested comment from former Mayor Keith Hartman as he was the sitting Mayor at the time Bonanni was hired as the acting Township Manager. We asked whether Council was afforded all of the pertinent information regarding Bonnani in his interview in order to make a decision as well as if a formal background check should have been required prior to appointment. Hartman stated, "We voted to place Bonanni in on a temporary basis while we looked for a permanent replacement. His performance in public works and previous interim manager experience made him a logical choice. Deputy Mayor Purdy had selected him and lobbied for his appointment. My choice was to go to Tom Henshaw immediately but there was concern over his lack of being a push over and certain members of council wouldn't " play nice" with him despite his qualifications. My decision was based on Bonanni's prior performance. To my knowledge at that time he was a professional. Obviously, in retrospect, if the allegations are true it was a bad decision. I felt Bonanni did well executing agenda items in a timely manner until the discipline of our Clerk. At that point I began to opine that he was playing politics for members of council. I expressed my concern over how he was handling the Clerk situation. My concern was as a sole councilman and I expressed I was not representing a consensus at that time, merely my opinion. I don't believe a thorough investigation would be prudent. At the time we all had experience with Bonanni and he was a long standing Township employee. I don't believe a background check would have produced this type of conduct that is alleged. Unfortunately, you hire people and sometimes they aren't always what they proffer at an interview." Many questions have surfaced lately as to whether Bonanni had a contract with the Township or if Bonanni was entitled to the payout. The Township explicitly explained to Bonanni the MOU was not a contract of Employment. A individual posting on GallowayTwpNews.com posing as Bonanni , stated "THIS WAS THE LAW(ORDINANCE) IN 1979 WHEN I WAS APPOINTED. i ALSO HAD A CONTRCT WITH THE TOWNSHIP PRIOR TO BEING ASKED TO FULLFUL THIS POSITION. ALSO i HAVE FROM FINANCE OFFICE SIGNED WITH THIS .AMOUNT.. Mr. Purdy signed contract and made various recommendations on staFFING. i WILLBE PURSUING LEGAL ACTION IN THE NEAR FUTURE. i HAVE BEEN QUITE TO LONE. The truth must come out. many lies have been preented by the blogger." The decision of Council to not authorize the payout will for sure continue in the upcoming months if Bonanni decides to pursue litigation. It is our opinion, Council can still form the investigative committee at any time in order fully investigate what did or did not occur as alleged. Council would also be able to track how much money if any as alleged, Bonanni used on Township time and if any official misconduct did indeed occur. Most of the research has already been completely and publicized by multiple media outlets including the main exposure from GallowayTwpNews.com. We have also released Bonanni's full personnel file below. Bonanni is also listed in his personnel file as having worked for Galloway Township's Police Department. Part of the work as detailed in the file, include details working at Absegami High School. It was also alleged by former publisher Harry Scheeler, that an Absegami High School Graduate turned prostitute also showed up in Bonanni's Township Issued cell phone bills. Well I feel the TWP did the right thing not giving him the money, now I feel as a Tax payer they should form a committee to investigate him further,and in see what the hold up is in the prosecutors office in this case?.. Maybe I’m not reading this correctly but the way I interpret this is that Bonanni was not tied to any specific schedule, but instead, was considered a 24/7 employee. Correct? If this is the case then we shouldn’t be concerned with the whole “company time” vs. “personal time”. It shouldn’t matter that he was teaching at Rutgers and the whole working through lunches doesn’t seem relevant. With that said, there are plenty of immoral/illegal allegations that have been brought to light but at this point those are still allegations which means that Bonanni may have a leg to stand on if does choose to fight this thing. To the contrary. Mr. Bonanni was still required to comply with the filing of time sheets. Although the time sheets list only the amount of hours work I.e. 7 or 8 hours, the normal schedule Bonnani set for himself was 7:30 to 3:30. However, since he is a salaried employee, hours could change which include council meetings and/or other meeting as required. Since he was considered a salaried employee, to specifically define hours per day is a task. Therefore, in my opinion, regardless of the time of day he was teaching at Rutgers which were all day time, It is policy of Rutgers that vacation time or personal time is to be taken on those days he is scheduled to teach. There are a variety of issues which is why a thorough investigation of time should be conducted.